The pomegranate (Punica granatum) is a fruit-bearing deciduous shrub or small tree, Punica granatum. Pomegranate also is used to refer to the fruit of this tree, which is characterized by a tough rind, which when opened reveals a plethora of small red berries surrounded in pulp. The pomegranate is native from Persia Iran to the Himalayas in northern India and has been cultivated and naturalized over the whole Mediterranean region including Armenia since ancient times. The fruit, which advances the pomegranate's individual purpose of reproduction, provides values for animals and humans as food. The pomegranate usually is sliced up by people, and the berries are eaten raw. However, it also commonly is served as a drink in the Middle East, as a syrup used in cocktail mixing, and ground up to be used in traditional recipes. Wild pomegranate seeds are sometimes used as a spice, most notably in Indian and Pakistani cuisine. In Turkey, it is served in salads and is fermented to make high-quality wine. In Greece, pomegranate is used in many recipes, as a glaze, in a relish, as a dip, or made into a liqueur for popular Greek sweets. In addition to providing a unique and delightful taste for people, the fruit also is nutritious. In the global functional food industry, pomegranate is often mentioned among a novel category of exotic plant sources called "superfruits" (Gross 2007a). It earns this status from its abundance of health benefits, such as reducing heart disease, relieving blood pressure, and battling prostate cancer, lymphoma, and diabetes. The pomegranate also serves as a symbol in many cultures. It is a common motif in Christianity, the fruit of choice on the Jewish holiday, Rosh Hashanah, and a recurring token in Greek and Roman mythology. It continues to serve a symbolic purpose in Greek culture, showing up in weddings, funerals, new home purchases, and the new year, serving as a symbol for abundance, fertility, and good luck. The pomegranate, Punica granatum is placed in the flowering plant family Lythraceae. Previously, the genus Punica was placed in its own family of Punicaceae, but recent phylogenetic studies have shown that Punica belongs in Lythraceae, and it is classified in that family by the Angiosperm Phylogeny Group. The only other species in the genus, the Socotra pomegranate (Punica protopunica), is endemic on the island of Socotra. It differs in having pink (not red) flowers and smaller, less sweet fruit. Pomegranate is widely cultivated throughout Iran, India, the drier parts of southeast Asia, Malaysia, the East Indies, and tropical Africa. Introduced into California by Spanish settlers in 1769, pomegranate now is cultivated mainly in the drier parts of California and Arizona, with its fruits exploited commercially as juice products gaining in popularity since 2001 (Fletcher 2006; Food Navigator 2006). Pomegranate grows to 5–8 meters tall. The leaves are opposite or sub-opposite, glossy, narrow oblong, entire, 3–7 centimeters (cm) long and 2 cm broad. The flowers are bright red, 3 cm in diameter, with five petals (often more on cultivated plants). The fruit is between an orange and a grapefruit in size, 7–12 cm in diameter with a rounded hexagonal shape, and has thick reddish skin and around 600 seeds (Aqua Pheonix 2007). 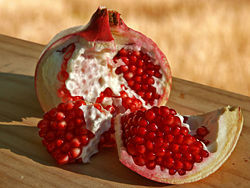 The edible parts are the seeds and the red seed pulp surrounding them; indeed, the fruit of the pomegranate is a berry. There are some cultivars that have been introduced that have a range of pulp colors like purple. Pomegranates are drought tolerant, and can be grown in dry areas with either a Mediterranean winter rainfall climate or in summer rainfall climates. In wetter areas, they are prone to root decay from fungal diseases. They are tolerant of moderate frost, down to about −10°C. The pomegranate originated from Iran and has been cultivated in Central Asia, Georgia, Armenia, Azerbaijan, and the Mediterranean region for several millennia (Doijode 2001). In Georgia, and Armenia to the east of the Black Sea, there are wild pomegranate groves outside of ancient abandoned settlements. The cultivation of the pomegranate has a long history in Armenia; decayed remains of pomegranates dating back to 1000 B.C.E. have been found in the country (Mkrtchyan 2003). Carbonized exocarp of the fruit has been identified in Early Bronze Age levels of Jericho, as well as Late Bronze Age levels of Hala Sultan Tekke on Cyprus and Tiryns. 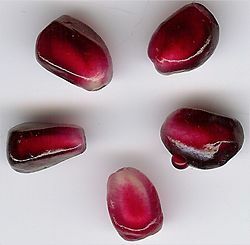 A large, dry pomegranate was found in the tomb of Djehuty, the butler of Queen Hatshepsut; Mesopotamian cuneiform records mention pomegranates from the mid-Third millennium B.C.E. onwards (Zohary 2000). It is also extensively grown in South China and in Southeast Asia, whether originally spread along the route of the Silk Road or brought by sea traders. The ancient city of Granada in Spain was renamed after the fruit during the Moorish period. Spanish colonists later introduced the fruit to the Caribbean and Latin America, but in the English colonies it was less at home: "Don't use the pomegranate inhospitably, a stranger that has come so far to pay his respects to thee" the English Quaker Peter Collinson wrote to the botanizing John Bartram in Philadelphia, 1762. "Plant it against the side of thy house, nail it close to the wall. In this manner it thrives wonderfully with us, and flowers beautifully, and bears fruit this hot year. I have twenty-four on one tree…. John Fothergill says, of all trees this is most salutiferous to mankind" (Leighton 1976). The pomegranate had been introduced as an exotic to England the previous century, by John Tradescant the elder, but the disappointment that it did not set fruit there led to its repeated introduction to the American colonies, even New England. It succeeded in the South: Bartram received a barrel of pomegranates and oranges from a correspondent in Charleston, South Carolina, 1764. Thomas Jefferson planted pomegranates at Monticello in 1771: he had them from George Wythe of Williamsburg (Leighton 1976). After opening the pomegranate by scoring it with a knife and breaking it open, the arils (seed casings) are separated from the skin (peel) and internal white supporting structures (pith and carpellary membrane). Separating the red arils can be simplified by performing this task in a bowl of water, whereby the arils will sink and the white structures will float to the top. The entire seed is consumed raw, though the fleshy outer portion of the seed is the part that is desired. The taste differs depending on the variety of pomegranate and its state of ripeness. It can be very sweet or it can be very sour or tangy, but most fruits lie somewhere in between, which is the characteristic taste, laced with notes of its tannin. Pomegranate juice is a popular drink in the Middle East, and is also used in Iranian and Indian cuisine; it began to be widely marketed in the United States in 2004. Pomegranate concentrate is used in Syrian cuisine. Grenadine syrup is thickened and sweetened pomegranate juice; it is used in cocktail mixing. Before the tomato arrived in the Middle East, grenadine was widely used in many Persian foods; it can still be found in traditional recipes such as fesenjan (a thick sauce made from pomegranate juice and ground walnuts, usually spooned over duck or other poultry and rice) and ash-e anar (pomegranate soup). Wild pomegranate seeds are sometimes used as a spice, known as anardana (which literally means pomegranate (anar) seeds (dana) in Persian). It is used as a spice most notably in Indian and Pakistani cuisine, but also as a replacement for pomegranate syrup in Persian and Middle Eastern cuisine. The seeds are separated from the flesh, dried for 10–15 days and used as an acidic agent for chutney and curry production. The seeds may also be ground in order to avoid seeds becoming stuck in the teeth when eating dishes prepared with them. The seeds of the wild pomegranate daru from the Himalayas is considered the highest quality source for this spice. In Turkey, Armenia, and Azerbaijan, pomegranate (Turkish: nar; Azerbaijani: nar; Armenian: nur) is used in a variety of ways, notably as pomegranate juice. In Turkey pomegranate sauce, (Turkish: nar ekşisi) is used as a salad dressing, to marinate meat, or simply to drink straight. Pomegranate seeds are also used in salads, in Muhammara (Turkish Walnut Garlic Spread), and in Güllaç, a famous Turkish dessert. In Azerbaijan and Armenia, pomegranate is also used to make high-quality wine, which is successfully exported to other countries. In Greece, pomegranate (Greek: ροδι, rodi) is used in many recipes. These include kollivozoumi, a creamy broth made from boiled wheat, pomegranates, and raisins; legume salad with wheat and pomegranate; traditional Middle Eastern lamb kabobs with pomegranate glaze; pomegranate eggplant relish; and avocado and pomegranate dip. Pomegranate also is made into a liqueur and popular fruit confectionery, Greek Sweets of the Spoon, that can be used as ice cream topping, or mixed with yogurt, and even spread as jams over toast for breakfast. Providing 40% of an adult's daily vitamin C requirement per 100 milliliter serving, pomegranate juice is also a good source of folic acid and antioxidant polyphenols. The most abundant polyphenols in pomegranate juice are the hydrolyzable tannins punicalagins, shown in 38 peer-reviewed research publications over 1990-2007 to have potent free-radical scavenging ability (Gross 2007b). Many food and dietary supplement makers have found the advantages of using pomegranate extracts (which have no sugar, calories, or additives) instead of the juice as healthy ingredients in their products. Many pomegranate extracts are essentially ellagic acid, which may only be absorbed into the body after consumption of punicalagins (Mertens-Talcott et al. 2006). In preliminary laboratory research and human pilot studies, juice of the pomegranate has been found effective in reducing heart disease risk factors, including LDL oxidation, macrophage oxidative status, and foam cell formation, all of which are steps in atherosclerosis and cardiovascular disease (Avariam et al. 2004; Esmaillzadeh et al. 2004; Kaplan et al. 2001). Tannins such as punicalagins have been identified as the primary components responsible for the reduction of oxidative stress, which led to these risk factors (NHI 2007). Pomegranate has been shown to reduce systolic blood pressure by inhibiting serum angiotensin-converting enzyme (ACE) (Aviram and Dornfeld 2001). Research suggests that pomegranate juice may be effective against prostate cancer and osteoarthritis (Brunette 2005; Science Daily 2005). In 2007, six clinical trials in the United States, Israel, and Norway have been approved to examine the effects of pomegranate juice consumption on parameters of prostate cancer or prostatic hyperplasia, diabetes or lymphoma (Clinical Trials 2007). The juice may also have antiviral and antibacterial effects against dental plaque (Neutrath et al. 2004; Menezes et al. 2006). The name "pomegranate" derives from Latin pomum ("apple") and granatus ("seeded"). This has influenced the common name for pomegranate in many languages (e.g., German Granatapfel, seeded apple). 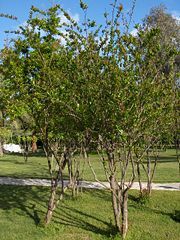 The genus name Punica is named for the Phoenicians, who were active in broadening its cultivation, partly for religious reasons. Consequently, in classical Latin the fruit's name was malum punicum or malum granatum, where "malum" was broadly applied to many apple-like fruits. A separate, widespread root for "pomegranate" is the Egyptian and Semitic rmn. Attested in Ancient Egyptian, in Hebrew rimmôn, and in Arabic rummân, this root was brought by Arabic to a number of languages, including Portuguese (romã), and Kabyle rrumman and Maltese "rumen" (Habeeb 2001). According to the Oxford English Dictionary, the weapon grenade derived its name, attested in 1532, from the French name for the pomegranate, which is la grenade (from which also comes the name applied to a kind of syrup, originally pomegranate syrup, widely used in cocktails and grenadine). Even though this fruit does not originate from China, one common nickname is "Chinese apple." Pomegranates have a long history in symbolism, religious decoration, and mythology. Exodus Chapter 28:33–34 directed that images of pomegranates be woven onto the borders of Hebrew priestly robes. I Kings Chapter 7:13–22 describes pomegranates depicted in the temple King Solomon built in Jerusalem. Jewish tradition teaches that the pomegranate is a symbol for righteousness, because it is said to have 613 seeds, which corresponds with the 613 mitzvot or commandments of the Torah. For this reason and others many Jews eat pomegranates on Rosh Hashanah. The myth of Persephone, the dark goddess of the Underworld, also prominently features the pomegranate. In one version of Greek mythology, Persephone was kidnapped by Hades and taken off to live in the underworld as his wife. Her mother, Demeter (goddess of the Harvest), went into mourning for her lost daughter and thus all green things ceased to grow. Zeus, the highest ranking of the Greek gods, could not leave the Earth to die, so he commanded Hades to return Persephone. It was the rule of the Fates that anyone who consumed food or drink in the Underworld was doomed to spend eternity there. Persephone had no food, but Hades tricked her into eating four pomegranate seeds while she was still his prisoner and so, because of this, she was condemned to spend four months in the Underworld every year. During these four months, when Persephone is sitting on the throne of the Underworld next to her husband Hades, her mother Demeter mourns and no longer gives fertility to the earth. This became an ancient Greek explanation for the seasons. It should be noted that the number of seeds that Persephone ate is varied, depending on which version of the story is told. The number of seeds she is said to have eaten ranges from three to seven, which accounts for just one barren season if it is just three or four seeds, or two barren seasons (half the year) if she ate six or seven seeds. There is no set number. The pomegranate also evoked the presence of the Aegean Triple Goddess who evolved into the Olympian Hera, who is sometimes represented offering the pomegranate, as in the Polykleitos' cult image of the Argive Heraion. According to Ruck and Staples (1994), the chambered pomegranate is also a surrogate for the poppy's narcotic capsule, with its comparable shape and chambered interior. On a Mycenaean seal illustrated in Joseph Campbell's Occidental Mythology 1964, figure 19, the seated Goddess of the double-headed axe (the labrys) offers three poppy pods in her right hand and supports her breast with her left. She embodies both aspects of the dual goddess, life-giving and death-dealing at once. The Titan Orion was represented as "marrying" Side, a name that in Boeotia means "pomegranate," thus consecrating the primal hunter to the Goddess. Other Greek dialects call the pomegranate rhoa; its possible connection with the name of the earth goddess Rhea, inexplicable in Greek, proved suggestive for the mythographer Karl Kerenyi, who suggested that the consonance might ultimately derive from a deeper, pre-Indo-European layer. In the sixth century B.C.E., Polykleitos took ivory and gold to sculpt the seated Argive Hera in her temple. She held a scepter in one hand and offered a pomegranate, like a royal orb, in the other. "About the pomegranate I must say nothing," whispered the traveler Pausanias in the second century C.E., "for its story is something of a mystery." Indeed, in the Orion story we hear that Hera cast pomegranate-Side into dim Erebus—"for daring to rival Hera's beauty," which forms the probable point of connection with the older Osiris/Isis story. Since the ancient Egyptians identified the Orion constellation in the sky as Sah the "soul of Osiris," the identification of this section of the myth seems relatively complete. Hera wears, not a wreath nor a tiara nor a diadem, but clearly the calyx of the pomegranate that has become her serrated crown (Schram 2007). In some artistic depictions, the pomegranate is found in the hand of Mary, mother of Jesus. In modern times the pomegranate still holds strong symbolic meanings for the Greeks. On important days in the Greek Orthodox calendar, such as the Presentation of the Virgin Mary and on Christmas Day, it is traditional to have at the dinner table "polysporia", also known by their ancient name "panspermia" in some regions of Greece. In ancient times they were offered to Demeter and to the other gods for fertile land, for the spirits of the dead and in honor of compassionate Dionysus. In modern times the symbolic meaning is assumed by Jesus and his mother Mary. Pomegranates are also prominent at Greek weddings and funerals. When Greeks commemorate their dead, they make "kollyva" as offerings that consist of boiled wheat, mixed with sugar, and decorated with pomegranate. It is also traditional in Greece to break a pomegranate on the ground at weddings, on New Years and when one buys a new home for a house guest to bring as a first gift a pomegranate, which is placed under/near the ikonostasi, (home altar), of the house, as it is a symbol of abundance, fertility, and good luck. Pomegranate decorations for the home are very common in Greece and sold in most homegoods stores (Edwards 2007). Aqua Phoenix. 2007. How many seeds does a pomegranate have?. Aqua Phoenix. Retrieved June 22, 2007. Aviram, M., and L. Dornfeld. 2001. Pomegranate juice consumption inhibits serum angiotensin converting enzyme activity and reduces systolic blood pressure. Atherosclerosis 158 (1):195-198. Avriam, M., M. Rosenblat, D. Gaitini, S. Nitecki, A. Hoffman, L. Dornfeld, N. Volkova, D. Presser, J. Attias, H. Liker, and T. Hayek. 2004. Pomegranate juice consumption for 3 years by patients with carotid artery stenosis reduces common carotid intima-media thickness, blood pressure and LDL oxidation. National Center for Biotechnology Information. Retrieved October 17, 2007. BBC News. 2006. Juce 'can slow prostate cancer'. BBC News. Retrieved June 22, 2007. Brunette, L. 2005. Can pomegranates prevent prostate cancer? A new study offers promise. EurekAlert!. Retrieved June 22, 2007. Clinical Trials. 2007. Pomegranate. Clinical Trials. Retrieved October 17, 2007. Doijode, S. D. 2001. Seed storage of horticultural crops. New York: Haworth Press. ISBN 1560228830. Edwards, T. B. 2007. Christmas traditions in Greece. Christmas Magazine. Retrieved October 17, 2007. Esmaillzadeh, A., F. Tahbaz, I. Gaieni, H. Alavi-Majd, and L. Azadbakht, L. 2004. Concentrated pomegranate juice improves lipid profiles in diabetic patients with hyperlipidemia. National Center for Biotechnology Information. Retrieved October 17, 2007. Fletcher, A. 2006. Superfruits set to dominate flavour market. Food Navigator. Retrieved October 17, 2007. Food Navigator. 2006. Demand for exotic fruits set to increase in 2006, report. Food Navigator. Retrieved October 17, 2007. Graham, S. A., J. Hall, K. Sytsma, and S.-H. Shi. 2005. Systematics: Phylogenetic analysis of the Lythraceae based on four gene regions and morphology. International Journal of Plant Sciences 166 (6): 995. Gross, P. M. 2007a. Superfruits take center state. NPI Center. Retrieved October 17, 2007. —. 2007b. Exotic antioxidant superfruits: Pomegranate punicalagins, ancient aril antioxidants. NPI Center. Retrieved October 17, 2007. Kaplan, M., T. Hayek, A. Raz, R. Coleman, L. Dornfeld, J. Vaya, and M. Aviram. 2001. Pomegranate juice supplementation to atherosclerotic mice reduces macrophage lipid peroxidation, cellular cholesterol accumulation and development of atherosclerosis. National Center for Biotechnology Information. Retrieved October 17, 2007. Leighton, A. 1976. American Gardens in the Eighteenth Century: "For Use or For Delight". Boston: Houghton Mifflin. ISBN 0395247640. Menezes, S. M., L. N. Cordeiro, and G. S. Viana. 2006. Punica granatum (pomegranate) extract is active against dental plaque. National Center for Biotechnology Information. Retrieved October 17, 2007. Mertens-Talcott, S. U., P. Jilma-Stohlawetz, J. Rios, L. Hingorani, and H. Derendorf. 2006. Absorption, metabolism, and antioxidant effects of pomegranate (Punica granatum l.) polyphenols after ingestion of a standardized extract in healthy human volunteers. Journal of Agricultural and Food Chemistry. 54(23): 8956-8961. Mkrtchyan, G. 2003. Shopping for a symbol? : The pomegranate has a long tradition and mythology. ArmeniaNow. Retrieved June 22, 2007. Neutrath, A. R., N. Strick, Y. Y. Li, and A. K. Debnath. 2004. Punica granatum (pomegranate) juice provides an HIV-1 entry inhibitor and candidate topical microbicide. National Center for Biotechnology Information. Retrieved October 17, 2007. Nutrition Health Info. 2007. Nutrition health info: Pomegranate. Nutrition Health Info. Retrieved October 17, 2007. Ruck, C. A. P., and D. Staples. 1994. The World of Classical Myth: Gods and Goddesses, Heroines and Heroes. Durham, NC: Carolina Academic Press. ISBN 0890895759. Science Daily. 2005. 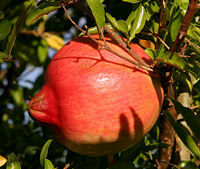 Pomegranate fruit shown to slow cartilage deterioration in osteoarthritis. Science Daily. Retrieved June 22, 2007. Salloum, H. 2001. Arabian memories in Portugal. Saudi Aramco World (March/April 2001). Retrieved June 22, 2007. Schram, P. 2007. Parashat Tetzaveh. Congregation B'Naai Jeshurun. Retrieved June 22, 2007. Zohary, D., and M. Hopf. 2000. Domestication of Plants in the Old World, 3rd edition. Oxford: Oxford University Press. ISBN 0198503571. This page was last modified on 31 March 2019, at 22:19.